Most significantly, I am not in any pain. In this sense, being pain-free, I have made a complete recovery. Jump down from a height of one meter or more, landing with all my weight on the injured leg. This causes severe pain. I can do this easily on the unbroken leg. trip in Canada in January 2017 followed by several weeks in Montana and Idaho. I will not know until then whether all this has been worthwhile. Still things could be worse. Except for the unknown in relation to skiing I have made, as near as practicable, a complete recovery from the accident. Thank you for your informative advice and thoughts. I am 65 years old always kept fit and walked and exercised. I knocked my knee at , a concert on a wooden skirting ! I had a Tibia Plateau fracture on the 24th November 2016. I had surgery for a plate and 4 screws, . I was in a cast for a month and Physio began three times a week after that. I live in Pakistan, I am originally from Sri Lanka. It was a miserable Christmas! I am walking bearing weight on the bad leg with a walker. The knee physio kills me but I am determined to get back my mobility. I am miserable that I cannot go to the gym or walk, but my faith in the Lord keeps me strong. Any further information on mobility will be welcome. Great to know you are fully recovered. If you want to see where I was at at your stage you should scroll back through the web-site. If your surgeon was good and you only wish to recover to the point of walking and going to the gym you will probably make a complete recovery. Its the more arduous stuff – running,skiing etc that’s a bit more problematic. I leave tomorrow for my second attempt at skiing post the accident almost two years ago. Good luck with the recovery. 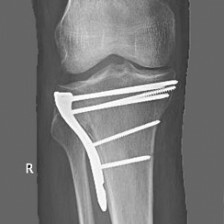 I have a tibial fracture plateau with a plate & 7 screws. I broke it running on my own in mid-sprint at footy training. Freak accident, slipped over. Ps I’m fucused on Physio & exercises to give my leg the best shot of recovery. you are only young so your recovery should be more rapid than mine however it will depend on many factors particularly the severity of the break and the skill of your surgeon. As you rightly point out you will have six weeks non-weight bearing then I went to full weight-bearing straightaway. The partial weight-bearing is preferred by some surgeons and not by others. As I could walk comfortably after about three months I can’t see why you wouldn’t be able to walk comfortably after four months. You should ask your physio. They are often more knowledgeable on aspects of recovery than surgeons. I certainly wouldn’t be planning a wedding less than four months after surgery. Maybe the first week of September would be safe.